Column filters are available in most modules and can be used to filter data to narrow down the information presented in the module’s list view. The column filters are dependant on your Encounter and Days Back filters. Filtering by keyword allows you to filter a list of module information (example: transcriptions or lab results) by the alphanumeric entries displayed in each column. 1. Identify the column you need to use to filter your list. Columns that have keyword filter capabilities display an empty dropdown box under the column’s header. 2. Click the dropdown arrows on the right side of the box to view a full list of available keywords for the selected column. 3. Click the checkbox next to the words you want to use to filter your list. Type text in the filter box to show matching keywords. The following image shows an example of text typed in filter box to only show available keywords that begin with onco (for oncology-related keywords). Clearing onco from the filter box will return the dropdown to its full list of keywords. 4. Your list will update to reflect the selections made in the column filter. Example: Selecting GI Investigations in the Name column filter of the Transcriptions module will result in a list of transcriptions that include GI Investigations in the Name column. 5. You can use multiple keywords and multiple columns to filter your module list view. 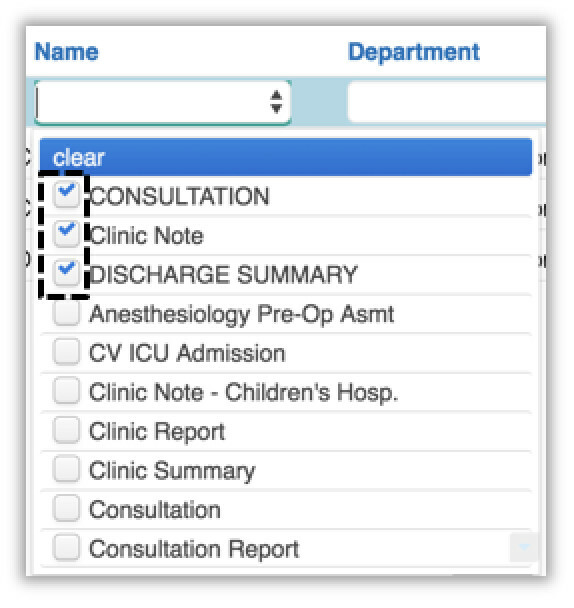 Example: If you wanted to see all discharge summaries from a specific doctor (Dr Sandy Drexler) in the Transcription module, you would select (check) Discharge Summary in the Name column filter and Drexler, Sandy in the Dictated By column filter. There are a few ways to modify or clear keyword filters depending on your data viewing needs. Click the Clear Filters button in the module header to reset all filters in all columns. This will return the list view to display all rows based on your Encounters and Days Back settings. This option is best when you want to start from the beginning and apply new column filters to the module. This is also the easiest option if you want to view the module in its original unfiltered state. Example: After entering a number of filters in multiple columns, you’d like to start over with new filter settings. It’s easer just to click the Clear Filters button and start fresh instead of accessing each column and modifying each individual keyword selection. 1. Locate the column you want to reset. 2. Click the dropdown arrows on the right side of the filter box under the column header. 3. Click the Clear Filter option at the top of the dropdown list. 4. Your list view will update to reflect the changes to the column’s filter. This option is helpful if you want to make changes to the keyword selections for just one column. 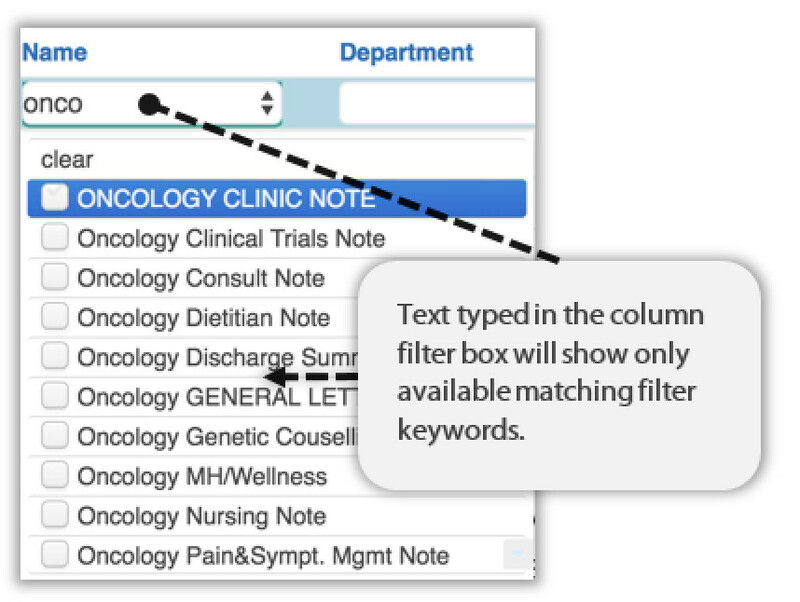 Example: You have 10 different Oncology keywords selected in the Name column of the Transcription module and now you want to select just discharge summaries. 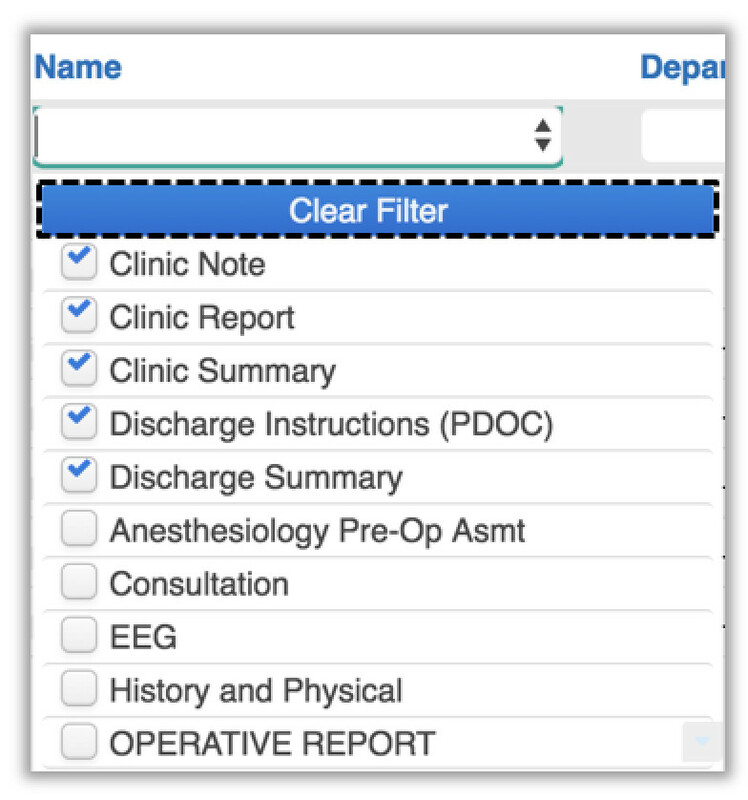 It’s easier to use the Clear Filter option instead of individually unchecking all those Oncology selections. 1. Locate the column you want to remove keyword filters from. 3. Uncheck each keyword you want to remove from the filter. This option is best if you want to make quick and simple changes to an existing filter selection. Example: Filtering the list of lab results to display just Electrolytes results instead of Sodium and Electrolytes. Instead of clearing all the module filters, or clearing the entire column of filters, you can just uncheck the Sodium selection and leave the Electrolytes selection. The column date range filter is used to filter a list of data by date range. Each date range filter uses two date filter boxes to set your preferred date range. 1. Locate the column of dates you want to use to filter your list. 2. Below that column’s header click the calendar icon in the first date filter. 3. Use the calendar popup and click a date to select it for your filter. This represents the earliest date in your date rage. 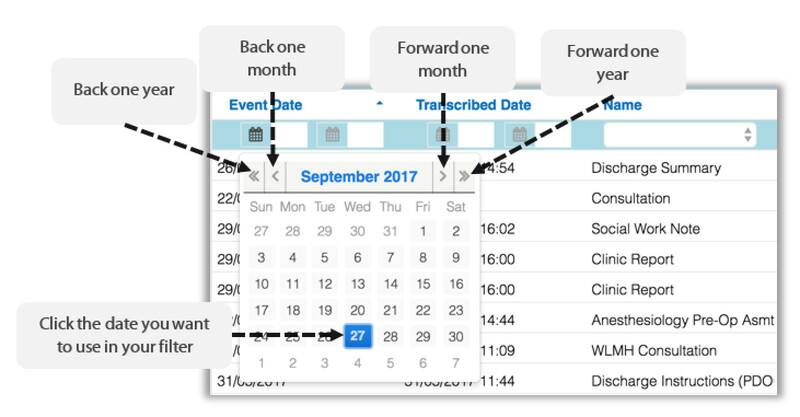 Note the calendar navigation arrows on the left and right of the month header that allow you to quickly change the month and year of the calendar. 4. Click the calendar icon in the second date filter box. You can also enter the text manually into each box using MM/DD/YYYY format. 5. Using the calendar popup click a date to select it for your filter. This represents the latest date in your date rage. 6. Once the second date is selected your list of data will be filtered to only show rows of information that fall within your date range filter. Example: The following is a list of transcriptions with an Event Date between 10/04/2017 to 16/05/2017. All other dates are filtered out of the list. 7. Delete the date entries in each box to reset the view to show all dates again. The date range filter does not override the settings of the Day’s Back filter. For example, if you set your date range filter to view transcriptions from three years ago, but your Days Back filter is only set to 60 days back, you may not see all the transcriptions you need. You can print the filtered list view results by clicking the Print button after entering your column filters. See Printing for more information on how to print list and detail views.